Pete Moore tests the Ultimate Knife from Gerber's range of Bear Grylls survival knives and tools. Who hasn't heard of Bear Grylls (BG), and his hit TV survival shows? 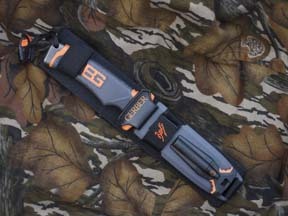 Gerber Legendary Blades have hooked up with him to offer a range of survival/utility knives and tools. The series is not specifically aimed at hunters, but at the general outdoors person. The range is not big and uses some existing Gerber models partially or wholly, but all are badged up with the grey and orange BG logo and come with his priorities of survival leaflet. This month we are looking at the Ultimate Knife, the largest in the series (apart from the machete like Parang) and a pretty good fixed blade design that will suit the hunter. 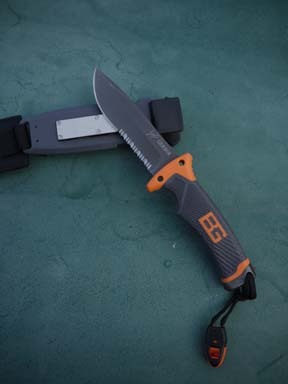 The build was familiar as the blade shape and style is based on Gerber's LMF II and Infantry models. There are even the same lashing holes up on the guard. However both handle and pommel differ considerably. There's also a rather technical sheath, which in conjunction with the knife makes up a mini survival system. The drop point blade is coated, high carbon, stainless steel and is 4.8" long. It's made from 4mm thick steel and is 30mm deep - a measurement that is retained for near 75% of the length, so it's strong. The grind is hollow with a 50/50, plain/serrated edge, with the tip showing a reasonable curve with enough point to get into tight areas for gutting and dressing out carcases. On top you'd be forgiven in thinking that someone had slipped with the grinder as there's a small ground section. It's not a mistake as it's a striking surface for the fire lighter that's included in the sheath. The build offers a full tang, with the nylon/rubber handle directly moulded on; at the base is a flat metal chequered pommel that can be used for hammering. The design shows a generous hilt made of hard polymer that is pierced by two lashing holes, so you can attach the Ultimate to a pole to make a spear - just right for close in wild boar... This flows back into a nice and grippy shape with a choil for the fore finger that tapers down slightly to accommodate the other three digits. 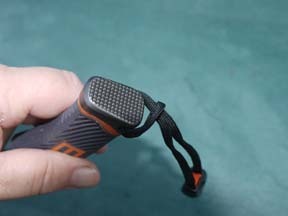 The colour theme of orange (hilt) and grey (main handle) is common throughout the range. I wonder why they did not go with all-orange, which would seem to make more sense? No matter. Tipping the scales at 11.2oz the Ultimate is surprisingly light in the hand and measures 10" tip to tail. It handles well and offers a superior grip in all conditions and is easy enough to use edge-up too. To complete the survival theme there's a small plastic whistle attached by a short lanyard to the pommel. When testing outdoor/working knives I am often more critical of the sheath than the blade, as it has to carry the knife securely. In this case the approach is totally hi-tech with a stiff nylon hanger that a synthetic scabbard attaches to by Velcro straps. 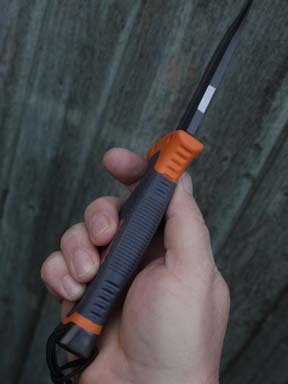 Integral to the design is a T-shaped, Ferrocerium rod fire starter that pulls out from the base. This is used on the ground flat on the top of the blade and strikes up a good shower of sparks every time. The rigid scabbard can be removed from the nylon hanger to reveal an integral, diamond sharpening plate. Retention of the knife is by a sprung mouth in the scabbard that engages with the hilt and a Velcro strap that wraps around the top of the handle. You can attach the knife in two ways as there's a standard, vertical belt loop and slots top and bottom to allow a horizontal or inverted carry too. Here I did find the main loop was masked a little, which effectively reduces the width of belt it can fit. On the back of the nylon hanger are ground to air and alpine rescue signals. Though not a hunting knife the BG Ultimate is well up to the job as it's big and practical enough for all chores and tough too. The inclusion of a sharpening plate just tops it off. The only question is, do you need a survival blade? If you do, then this one has some nice features. This article appeared in the July 2011 issue of Gun Mart, and is reproduced here with permission. 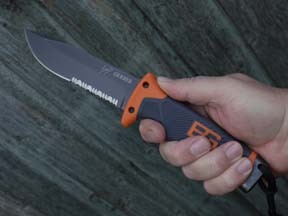 You can buy the Bear Grylls Ultimate Knife directly from this site.